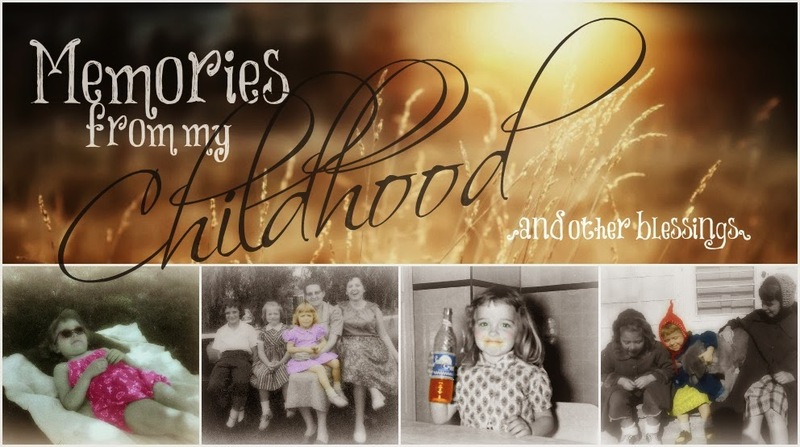 My Favorite Things: A Mother's Day....Memory? ...I know I have and I hope you have as well. But have you ever come across a so-called memory that you don't even remember? This is something I experienced this very week and it still has me puzzled. something fell out that had been tucked between the pages. It was some folded up papers that were tattered and yellowed, sealed in a zip-lock sandwich bag. and stapled to it was a two-page handwritten note. At the time I discovered it, I was up to my eyeballs with stuff. I promptly set it aside to read later and then possibly blog about it for Mother's Day. Y'all know how much I like to reflect on the good old days! ...until this week and then the hunt was on to find where I had put it. I tore my craft room apart trying to locate it and finally, there it was, hiding in plain sight. taking great care to not tear those brittle folded papers. I don't know how old I was when I when I wrote this. ...all I know was that I still spelled my name with an "ie"...(Debby with a "y" came later). ...one that said all those things that we say to our moms on their special day. You know, just oozing with all those loving expressions and declarations of our love for them. And so I began reading what looked to be 3rd or 4th grade cursive handwriting. When God made the family, He must have meditated a long time. The family must have food, shelter and clothing, and guidance, so there must be a mother. The family must not be dull, so there must be boy to shout and jump, run and get in the way. The family must not be forgotten, so there must be a girl, an angel who will make them so very, very proud. The family is a storehouse in which the world's finest treasures are kept. The small pleasures, the great sorrows, the dreams of the world are contained within these four walls called HOME. let alone presenting it to my mom...needless to say it didn't come from my heart...or my own mind. I can only guess that it must have been some sort of writing assignment. ...me, who remembers so many trivial and minute details from my childhood? Where has this memory-that's-not-a-memory been hiding all these years? I may never know...or, it may come to me tomorrow! All I know is that my mom undoubtedly got a big kick out of it! the last paragraph tugged at my heartstrings, bigtime. If the family is a storehouse then Mama must be the shopkeeper. Just the fact that this was preserved and that you found it now is special in and of itself. Maybe someday you will recall writing this.I think the words are quite charing and BTW the handwriting is beautiful. That is so lovely. It was obviously a treasured memory of your Mums to have kept it. From the heart. I am very lucky. First, my mother never saved anything from me! I was the third and final child. When I do find stuff, I have a much older sister who is my memory. Don't get me wrong about my MOm. I did love her, it was just the feeling was not always mutual. I find it interesting that you have no recollection of this piece of artwork for your mom. Even so, something fun to look back at and ponder as you try to remember who you were at that age. A nice bit of memorabilia to have in hand now. Wishing you a beautiful Mother's Day, Debbie! Oh, my goodness! This is so interesting! It is amazing that you can't remember it...I hope somehow the Lord reminds you of why you wrote it or something to jog your memory! It was so much fun to read, and oh, my! Your handwriting is just exceptional! Thank you so much for sharing, and I trust God is blessing you with a HAPPY MOTHER'S DAY, sweet friend!!! 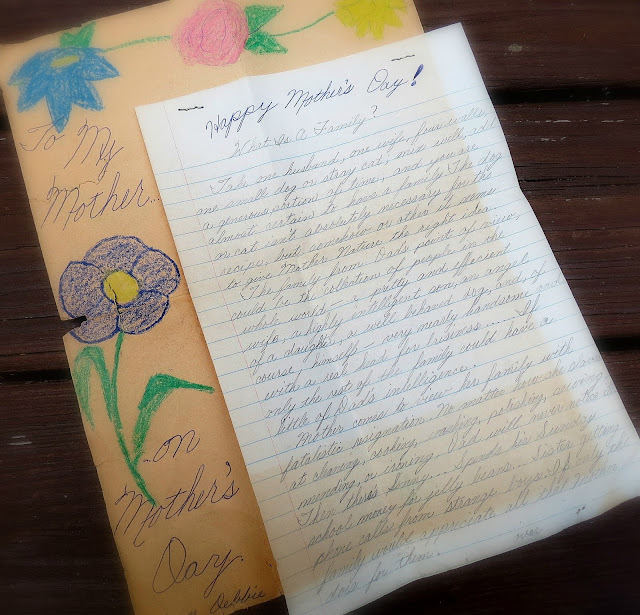 What an appropriate Mother's Day post, just a beautiful writing, even if you can't remember writing it. And, yes, love the shopkeeper and it's so true. Happy week friend! Such a precious Mother's Day post, Debby! I had to chuckle on the "keen" part.😄😄 too funny! My grandmother (mom's mother) was a penmanship teacher and she would have been quite impressed with your penmanship, just lovely. What a treasure! Happy Mother’s Day, my friend. I did enjoy reading what you wrote all those years ago. What a wonderful find! If I were guessing, which, of course, I am, I would say that that handwriting looks far more mature than third or fourth grade and that the thoughts contained are also far more mature. That brings me in at sixth or seventh grade, maybe later. Oh my goodness, Debby, this brought tears to my eyes. I'm like Vee in thinking that you were older, too. Those thoughts are very mature. What a special treasure you found. Thank you for sharing with us. What a find! You were a great writer even then! Even if your memory is not jarred, it is a lovely keepsake. It actually sounds like something from a child older than 3rd or 4th grade and very much like a writing assignment. Those are the things that bring photo albums and memory keeping to life (even if you cannot remember it right now)...now get it out of that plastic bag and into an acid-free album page before it deteriorates any more! Well, I was looking for something I saw in the comments of one of your posts and came across this. That letter! The last sentence is rich! MAY...we hodgepodge for a bit?